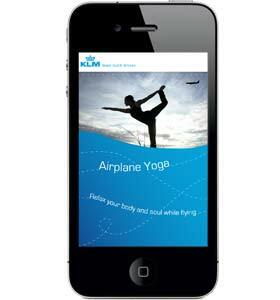 At NorthernLight we designed and created a series of different app concepts for KLM Royal Dutch Airlines. These concepts are the result of a small research project on how KLM could improve the customer experience. With this app users can see trough the airplane and watch the land below. WNF pins are placed in a number of locations and when users click upon these pins they can read about the animals that live in the area. A game based on the real control system of an aeroplane, by which the pilot has the ability to steer in three directions. The user has to steer the swan through as many rings as possible – the more the better. And to add more competition to the game, users can battle with other people in the plane. On longer flights almost everybody experiences stiffness. This app provides users with a series of yoga exercises that they can do whilst sitting in their seats. App users will also benefit from a series of relaxation techniques.